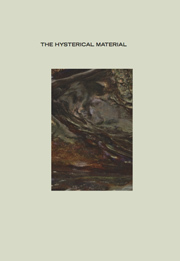 Published in relation to an exhibition of the same name at the Smart Museum of Art at The University of Chicago, The Hysterical Material is a book about feelings and emotion. Specifically, it is about how these twin registers are represented and produced in both the materiality of the body and in the objects we call art. Beginning with the premise that hysteria can be best understood phenomenologically rather than in pathological terms, this publication considers the possibilities of the body as an emotional instrument not always understood by the rational mind. This potential is investigated in the work of two leading artists of Western art history, Auguste Rodin (1840–1917) and Bruce Nauman (born 1941). The body is something used and depicted in the work of both of these artists; however, they employ it in radically different ways. While Rodin was a master of conflating representation and material, Nauman uses figurative representation to plumb the depths of the psychological body. Calling attention to the artists’ mutual artistic concerns, this publication explores the multiple possibilities of a bodily and affective engagement with art. Co-published with the Smart Museum of Art, The Hysterical Material was designed by David Khan-Giordano and Geof Oppenheimer.